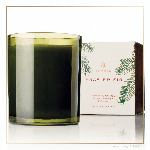 Thymes Frasier Fir Green Glass Candle is the classic seasonal fragrance that's perfect for holiday celebrations. With the aromatic snap of Siberian Fir needles, heartening cedarwood and earthy sandalwood, Thymes Frasier Fir evokes the warmth and comfort of the holiday season. Fill your surrounding with crisp, just-cut forest fragrance that evokes holiday memories.